Make sure that your music is consistent throughout. There are no silent gaps, or loud moments that intercept talking points so your viewer can’t hear what’s actually being said. Nothing is worse, as a viewer, then wanting to hear important information about a brand only to be interrupted by music. Overall, make sure your music is consistent throughout. Just as important as it is for your music to play consistently it’s just as important for voices to be heard clearly. Echo is typically the issue and its one of the hardest issues to fix in post production. My advice? Make sure that you are recording voices clearly from the beginning. If you don’t realize until post production, there are the ways you can fix it with different noise effects. Trust me, viewers love transitions. However, there is such thing as too many transitions throughout a video. I would only stick with 1-2 different types of transitions throughout the video. Also, you don’t need a transition for EVERY SCENE. If it makes sense based on the music or the subject then definitely include it. However, if you’re talking or interviewing someone a transition is not needed to transition them to their next sentence. Yes, your graphics are just as important. This means that font style, size, and the length the play in your video are consistent throughout. If you have a title slide that’s yellow in one scene and then purple in another scene things aren’t going to add up for your viewer. This is pretty self explanatory but I’ve even had moments where a video is uploaded and then I notice I’ve misspelt my own name. Mistakes happen but double checking will make sure that they don’t happen as often. This is based on where you’re going to be uploading your video to. Make sure that you’ve done your research and know the settings you should set for your video to export correctly based on the platform. For an example, the settings I use to export a video that will be uploaded to YouTube are completely different then the settings I use to upload a video to IGTV. Make sure to export correctly! There you have it! 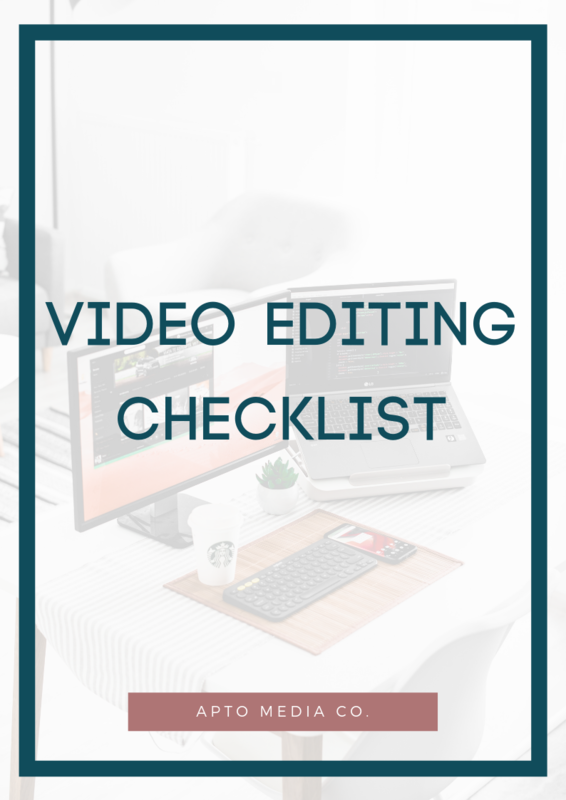 Those are my top tips to make sure that your video is edited to perfection. Here’s your free guide that includes items you should include in every video, a checklist of everything above, and some tips on how to create the perfect video for your brand. As always let me know if you’ve used the guide above and the video you used to edit with it. We will definitely share it on Apto Media’s social media platforms.